All of my artwork is centered on what I love most which is nature, all animals, and fantasy. I love telling stories and creating images that you have to look at closely to be able to see everything. This is because I put so much detail into every aspect of each piece. I also enjoy ornamentation design and often put borders around my pieces that complement my love for all things decorative. I strive to make art, from cards to etchings, that can be accessible to a wide variety of people; art that can take anyone to a new place or an old memory. Drawing is at the core of every piece of artwork I create. Every illustration is hand-drawn to scale as a detailed pencil drawing first, usually on bristol board with a 2H or technical pencil. I then go over my pencil work with black archival ink pens to create my originals. My printmaking work goes hand and hand with my drawing work. I’ll transfer a pencil drawing onto copper and draw the image again with an etching needle. The plate then is etched in an acid bath and printed on my table-top etching press. Both my etchings and ink drawings get scanned into Adobe Photoshop to be colored digitally. This allows me to experiment along the way, and add colors in ways you can’t traditionally. I do sometimes watercolor as well. Every piece takes weeks to make, having so many stages to the process, but in the end I think it’s well worth it! This illustration is based on a scene from Gaston Leroux's "The Phantom of the Opera", in chapter twelve, Apollo's Lyre. Christine and Raoul discuss the truth behind her trip with the Opera Ghost down into his house by the lake. Little do they know, he is hiding and observing their every move! The scene is described as follows: "...against the crimson sky with bronze grandeur. It was a beautiful sunset ablaze with the colors of spring. Clouds, lightly clad in gold and purple by the setting sun, drifted slowly by." I drew my inspiration from the sunset, and from other parts of the book to create the border of roses, angels of music, the chandelier, and masquerade masks. All in tribute to my grandmother, who instilled in me an undying love for this story and all those who wear a mask. This digital illustration is based on Una and the Lion from Edmund Spenser’s epic poem, The Faerie Queene. In the poem, Una encounters a fierce lion while on her quest to help free her parents from a dragon. The lion is so captivated by her beauty and innocence that he decides not to eat her and instead becomes her protector. A much better plan I think! This digital illustration is based on Luna, the goddess of the moon. I surrounded her with animals associated with the moon, or the night. A barn owl, a wolf, and many moths and faeries in the border. 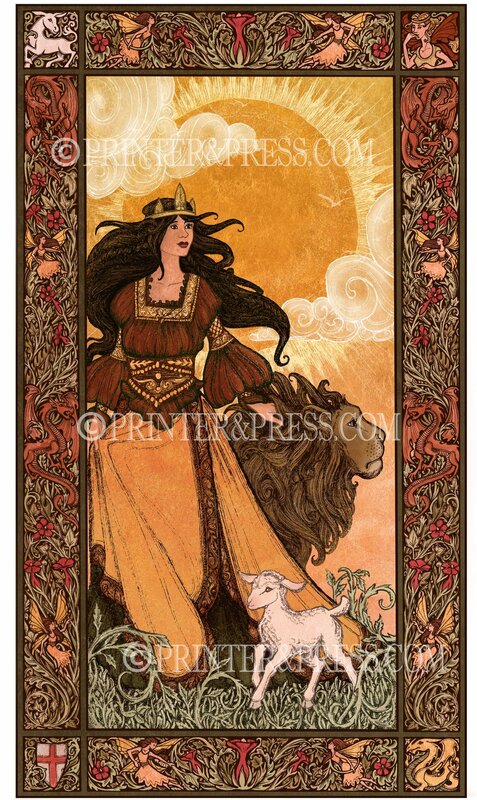 This magical print is mysterious and beautiful. I wanted to make a piece based on the Chronicles of Narnia for a long time, I feel that the relationship that Aslan and Lucy have fits well with my body of work. I have put both of them on an expansive beach (modeled after lake Michigan actually, because why not) with the lovely castle of Cair Paravel in the distance. A delicate Faerie curtsies to the King of the Frogs, while her Faerie friends watch from the corners. This piece came to me when I knew I wanted to make an illustration with faeries, and once I added the frog I knew she had to be curtsying! It's such a magical scene, and of course the other faeries would be spying from behind the plants, because what faerie isn't just a little curious? This print was drawn from the song by Peter Paul and Mary, "Puff the Magic Dragon". Puff is patiently waiting in his cave by the sea, filled with musical instruments and magic. This piece was originally made as an intaglio etching, and has been scanned and digitally colored by me to make this colorful version. I had to try multiple instruments in his hands before deciding on the recorder. The rest of the instruments blocked his face! So I decided he would perhaps be a hoarder of musical instruments, as any good dragon is. After visiting the Cloisters in New York City, I became even more inspired by medieval art. At the gift shop, I purchased Chretien de Troyes’ thirteenth century “Arthurian Romances” book, a collection of four romances including Erec and Enide. First made as an etching print, it has been scanned and digitally colored to create this colorful version. The brave knight Erec leads his beautiful lady Enide on a dazzling white horse as she parades the precious sparrowhawk in the middle of all the townsfolk. 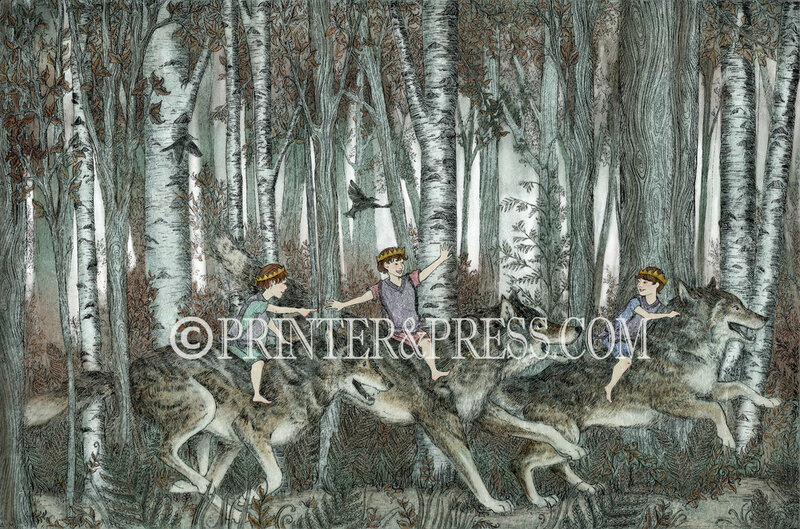 This illustration was inspired by dire-wolves and “Where the Wild Things Are”. I really wanted to create an illustration with wolves, as they are very popular. I decided it was also time to include a piece that had all boys. But I wanted to make sure the boys looked very small, and the wolves very large, but not scary. I’d like to think they are having a fabulous time romping through the birch forest, three princes and their wolves. This piece captures the most magical moment from the fantasy book, Mists of Avalon, when Morgaine is tasked with parting the mists in order to enter the world of Avalon. The blue and white colors make the picture come alive; you can almost feel the white swirling mist on your face when you look at this print. The center drawing for this piece was made as an intaglio etching, and the border was drawn in pen and ink before being scanned and colored digitally in Photoshop. This young girl has found a magical spot in the tangled woods to frolic and play with four frisky foxes. The lovely greens, browns, pinks, and white colors add to the beauty of this digital print. The original drawing for this piece was made as an intaglio etching before being scanned and colored digitally in Photoshop. In the light of a full moon, a lovely mermaid floats on the sea’s surface as she contemplates the approaching clipper ship, full of wonder and anticipation. Her iridescent green tail and milky white skin are in perfect contrast to the dark mystery of the ship. This illustration depicts Mary Boleyn riding towards Apple Tree Farm, a scene described lovingly in The Other Boleyn Girl. Mary, the sister of Anne Boleyn, has finally escaped the royal court to go and find the man she loves on his modest farm. Mistletoe and English roses create a beautiful floral border, along with the branches of a large apple tree. This print was drawn from the story of the Princess and the White Bear King, with the Princess riding a great white polar bear through a dark forest to a castle. The center illustration was done as an intaglio etching, and the border was drawn in pen and ink. This print was made first from an etching, based on the story of the Princess and the White Bear King, with the Princess riding a great white polar bear through a dark forest towards the castle. This piece shows the castle they are heading towards and the great expanse of the forest at sunrise! This print was drawn from the story of the Princess and the White Bear King, with the Princess dreaming of a golden crown. This piece was drawn entirely as a pen and ink drawing, scanned, and then colored digitally in Photoshop. I especially had fun drawing the twisty bear borders, and thinking of the most marvelous bed I could for her to sleep in. Long ago a great famine had spread over the land. Longingly, a mother bear and two famished cubs walked the shore on the Wisconsin side, gazing wistfully across the great lake at Michigan, which in those days was the land of plenty (as it is today). Finally hunger overcame their timidness and the bears launched out, trying to swim to Michigan. As they got closer and closer to the Michigan shore, the mother's words of encouragement urged on the weary cubs. When only twelve miles from the land of plenty, the mother's heart was rent as she saw a babe sink and drown. With the remaining cub she struggled to gain the beach. Two miles of slow dragging and the second of her beloved cubs also perished. The mother reached the beach, alone, and crept to a resting place where she lay down facing the restless waters that covered her lost ones. As she gazed, two beautiful islands slowly rose to mark the graves of the cubs. The Great Spirit Manitou created two islands (North and South Manitou Islands) to mark the spot where the cubs disappeared and then created a solitary dune to represent the faithful mother bear. The legend of the Sleeping Bear is quite sad, yet in this piece I've replaced the two cubs she lost with two children, a boy and a girl. This print was inspired by my love for dragons and for reading. I made this image of a small boy reading on the dragon also to echo my memories of my twin brother who was always always reading as a kid. “Out of the morning land, over the snowdrifts, beautiful Freya came tripping to scoring. White were the moorlands, and frozen before her; Green were the moorlands, and blooming behind her. Out of her gold locks shaking the spring flowers, Out of her garments shaking the south wind, around in the birches, awaking the throstles, and making chaste housewives all long for their heroes home, loving and love-giving, came she to scoring” - Charles Kingsley The Longbeards’ Saga. This illustration captures the most emotional moment from the novel, Peony in Love, when the ghost maiden is finally set free and blesses her former fiancé and friend. It is a tale of love and loss, desire and death. Peony in Love is an intricate original drawing which was ultimately put together using many digital layers. 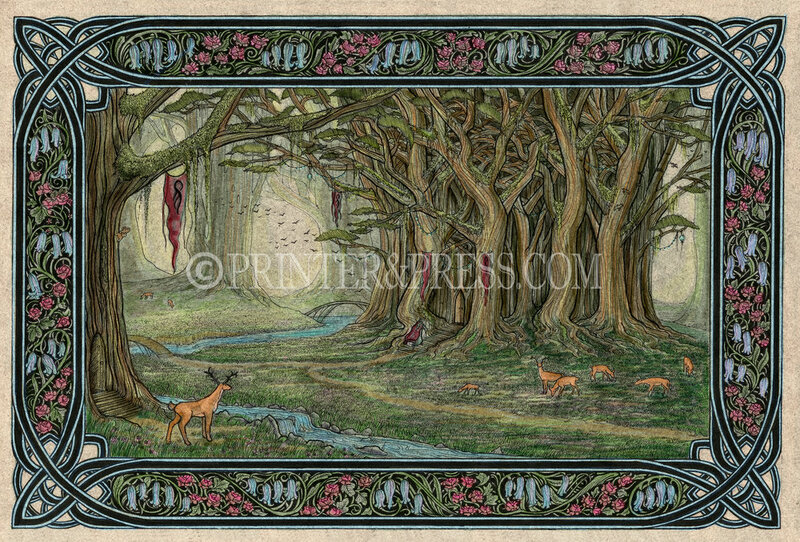 Ellesmera is an imaginary land where animals and elves dwell among clusters of ancient trees and forest brooks. Tiny roses and bluebells weave a lovely border around this peaceful scene. The inspiration for this original drawing comes from the fantasy novel, Eragon. This original drawing has been scanned and colored digitally in Photoshop.